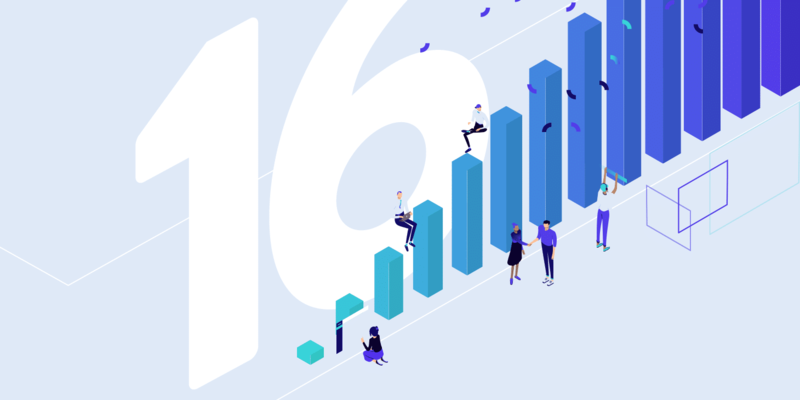 We use a multitude of different SaaS products here at Kinsta to keep everything running smoothly behind the scenes and to improve the productivity of our team. One product that we couldn’t live without is definitely G Suite! We aren’t afraid to come right out and say it’s by far the best email solution on the market right now for your business. 👍 Not to mention the other features that it comes with, such as Google Drive storage and tools such as Google Docs and Google Sheets. Today we’ll dive into the unparalleled benefits of G Suite, why we use it and recommend it to all of our clients, and how it compares to other similar solutions on the market. G Suite is Google’s suite of intelligent apps. This was formerly known as Google Apps, till it was re-branded in late 2016. We primarily recommend G Suite for clients that are needing email hosting for their business. However, G Suite is much more than just email. It also includes a variety of apps and features that can come in quite handy. In fact, you’re probably already using or are familiar with some of them. According to Litmus, Gmail leads the way as the most popular email client, with a whopping 26% of the market share based on open rates. It’s no surprise as Gmail has been around since 2004 and now boasts over 1.2 billion users. One of the best things about G Suite is you basically get an enhanced ad-free version of the online email client you’re probably already using. 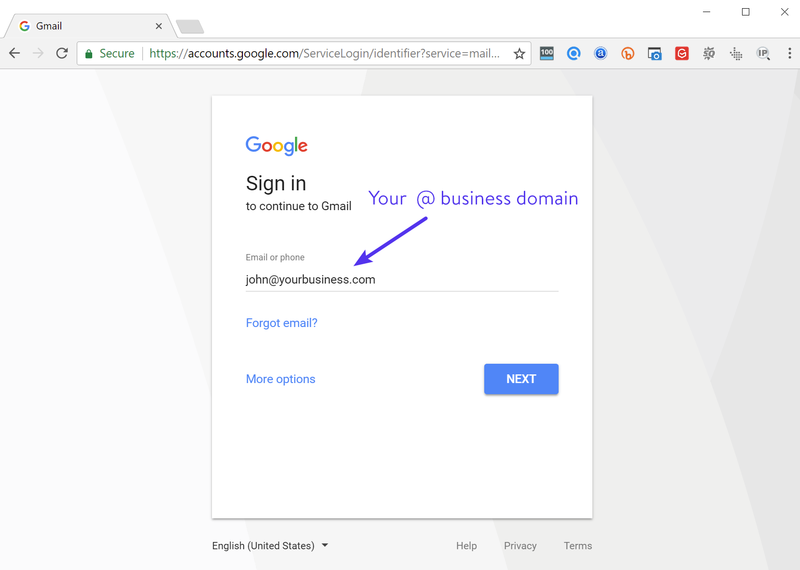 G Suite essentially allows your employees to have their own Gmail accounts with email addresses with your business domain name (example: john@yourbusiness.com). A very small business with one or two users might be able to get away with free Gmail accounts and some alias+forwarding rules. But once you start hiring two or three employees, you’ll find yourself needing accounts that can be managed separately. None of us here at Kinsta could live without Google Calendar. Many of us rely on it for scheduling calls with clients and setting due dates and reminders for important projects. 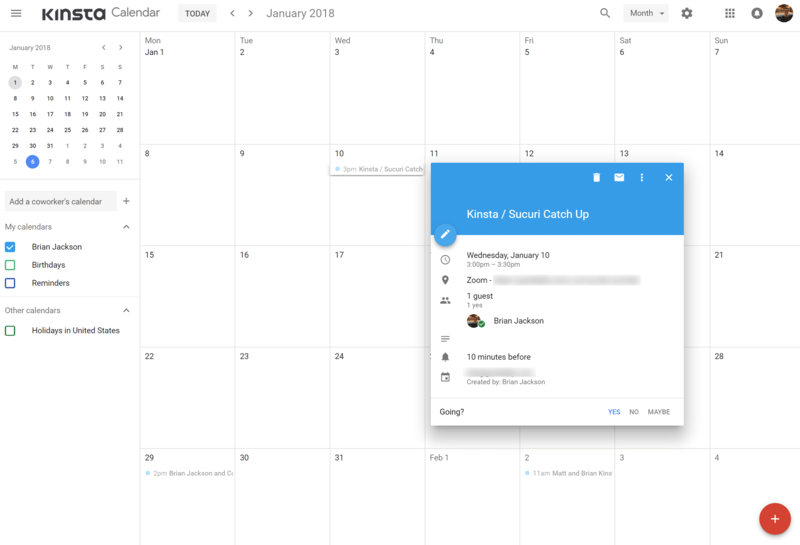 Google Calendar can help you keep your schedule organized. One of the great things about using Google Calendar in G Suite is the ability to create multiple calendars that are accessible to everyone in your company (or even a subset of users). For example, you might want a group calendar for events like team holidays and regular meetings. Having all your employees attached to the same organization makes tasks like these even easier when compared to the free version. Google Drive allows you to store, access, and share your files in one secure place. You then have easy access to them from any device. G Suite Basic plans come with 30GB of storage for every employee. G Suite’s Business, Enterprise, and Teams editions provide unlimited storage so you will always have enough space for your files. Note: If you’re a smaller team with fewer than 5 users, you only get 1TB/user. The paid version of Google Drive gives you twice the storage of your free personal drive and Gmail, 24/7 support, sharing controls, and advanced reporting. Google Docs and Google Sheets pretty much speak for themselves and again are tools we use every single day. These allow you to create and edit text documents and spreadsheets right in your browser. Import your documents to make them instantly editable, including Microsoft Word, Excel, and PDF files (.docx, .doc, .pdf, .rtf, .txt, xlsx, .csv, .html, .ods). As of February 2018, you can now even collaborate and comment on Microsoft Office files without it having to automatically convert to Google’s format. You can also export to common third-party formats. This makes it easy to collaborate with other individuals or companies and send files back and forth, without ever needing to install or purchase additional software. Getting feedback and comments from team members on new website content. Working with guest bloggers on content for our blog. Sending content to others when writing on third-party sites. We’ve never had anyone in the past couple years request a Word document, everyone always requests a Google Doc. Why? Because it’s just super simple and easy to use. Crunching spreadsheet data from Ahrefs exports. Keeping track of PPC budgets and online advertising copy variations. Analyzing CTR changes as it pertains to SERPs. Writing up content for paid sponsorships (WordCamps). One of the best features of Google Docs and Spreadsheets is the real-time commenting and unlimited versions. Previous versions are kept indefinitely and they don’t count toward your storage. This makes it super easy to track changes made to a document or undo a mistake. Sharing documents with your coworkers or other individuals is also incredibly easy. 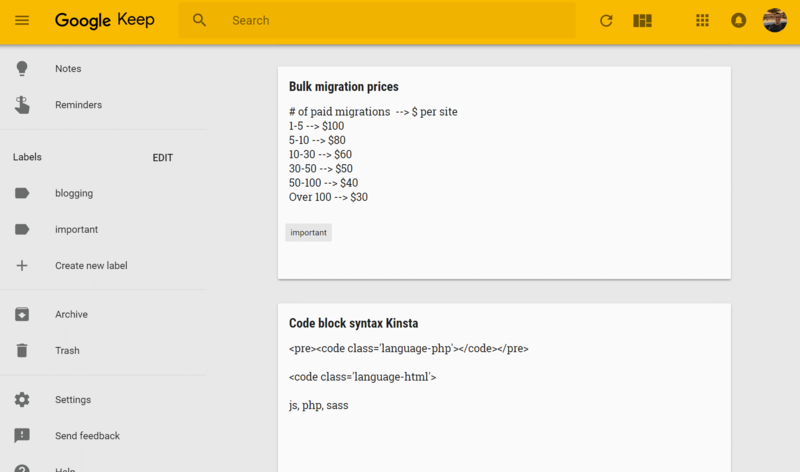 Google Keep seems to be one of those well-kept secrets that nobody knows about. If you’re looking for a basic Evernote alternative, Google Keep rocks! This is a great little tool regardless of whether or not you’re using G Suite. Being a Google product, it works flawlessly within the Google ecosystem. It can be an easy way to keep those frequently asked questions you get from customers in a convenient place. Create to-do lists, notes, and set reminders to stay on track. Everything syncs across your devices, so what’s important is always in reach. Easily share them with your team and archive them when you’re done. And once again Google’s search works flawlessly with it. 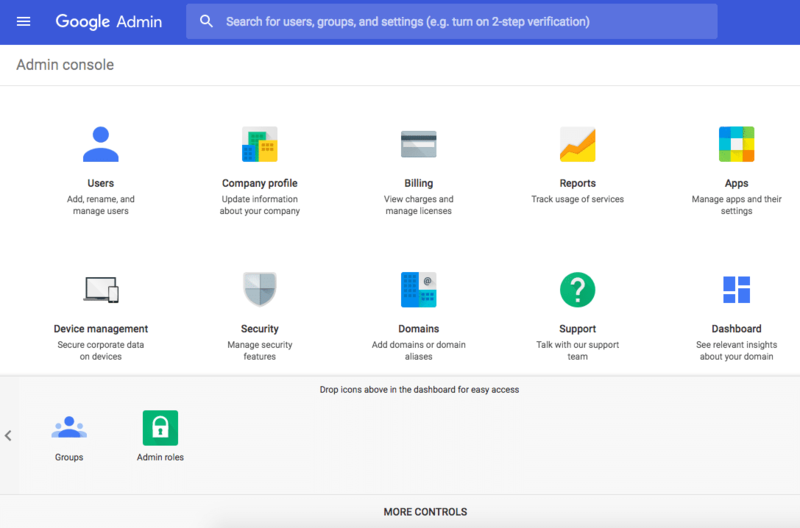 The Admin console for G Suite allows business owners easily manage everything from one single place. It got an overhaul recently and is a lot better than it was previously with Google Apps. Do everything from adding new users and groups, manage devices, configure security settings (like 2-factor authentication), add new custom domains for your business which can be used for Gmail, and even enable fun features like Inbox by Google for your employees. Most, if not all of the features in G Suite have to be enabled by the administrator in order to be used. Some of these are also only available in higher plans. If a feature is not enabled and a user tries to access it, they’ll see a “not available” message (as seen below). Google Hangouts Chat: Have you heard of Slack? The new Google Hangouts Chat (released February 2018) is basically Google’s new competing tool. It’s a dedicated group workspace with 1:1 chat and group chat. You can make conversations more efficient by interacting directly with deeply integrated Google bots and 3rd party apps. Hangouts chat is included for free with all G Suite plans. Google Hangouts Meet: We prefer Zoom or Slack video chat ourselves here at Kinsta, but Google Hangouts Meet still makes video calls and conferencing a breeze. Meet is fully integrated with G Suite, so you can join meetings directly from a Calendar event or email invite. If you’re running the Enterprise version of G Suite, you can also take advantage of dial-in numbers for when people are on the road or perhaps without internet access. Google Forms: Most of you have probably all filled out a Google Form before. While we prefer to use other applications for this, preferably branded forms in our WordPress site, it can be an incredibly quick and easy way to gather information. Google Slides: Want a decent alternative to Microsoft Powerpoint? Google Slides is just that. Just like with their other products you can take advantage of their real-time collaboration and commenting, as well as unlimited version history. Google Sites: We don’t recommend using Google Sites as WordPress is much better for this. Check out the reasons why you should use WordPress. Mobile Management: If you’re worried about an employee’s device getting stolen, don’t. That is what mobile management is for. Easily enable this as an admin and remotely wipe G Suite data from devices if needed. It’s also important to make a note of the additional features in G Suite Business and Enterprise plans. If you’re a bigger business and rely on email heavily, these can help ease some of your worries. 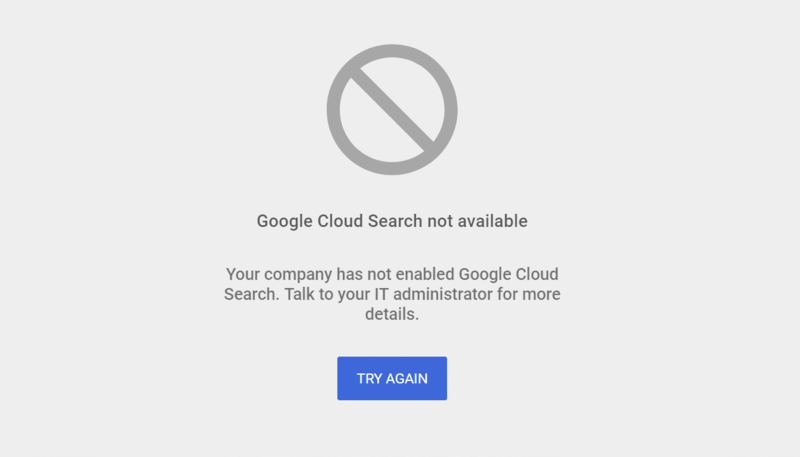 Cloud Search: Want to take search capabilities in G Suite even further? The Cloud Search feature allows you to search across your company’s content in G Suite. From Gmail and Drive to Docs, Sheets, Slides, Calendar, and more. Vault: You can never have too many backups. 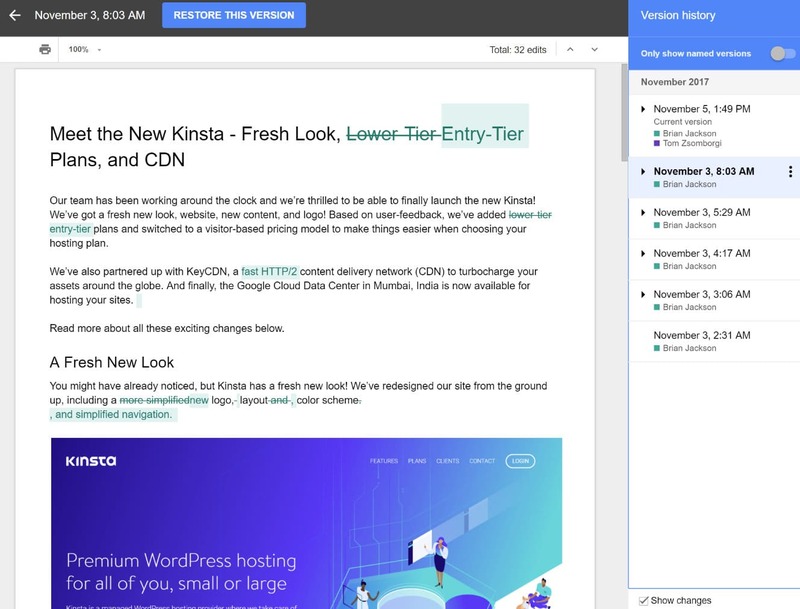 Vault allows you to manage, retain, search, and export your organization’s email, Google Drive file content and on-the-record chats. Basically, you can archive all your data and set retention policies. While all those features above are great, now it’s time to dive into some of the real benefits of using G Suite for your business. If you’re small and just starting out, don’t worry about your transaction emails until you start sending out large volumes. You can get started with just G Suite for everything and be just fine. Also, some of the providers like Mailgun above, let you send 10,000 transactional emails per month for free. So in a lot of cases, this doesn’t have to be an extra expense. And additional emails after that are pennies to send. Read more about transactional emails. Some of the transactional providers above also handle marketing emails and mention that on their sites. So in some cases, you could always combine your transactional email service and email marketing software. Read more about email marketing software. 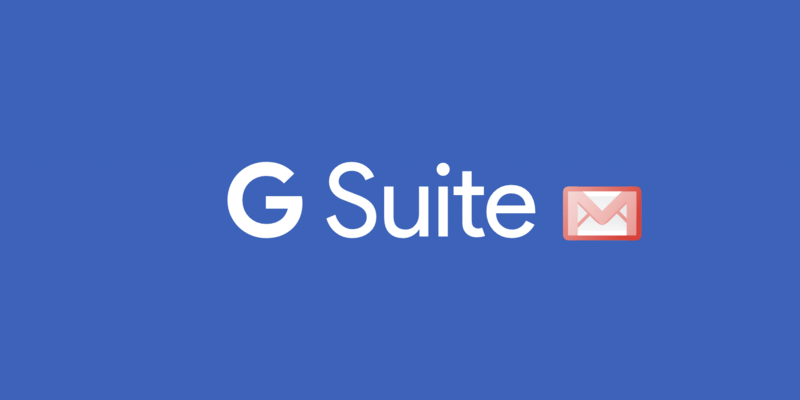 One of the greatest benefits of going with G Suite for your business is that most of your employees are probably already used to using products like Gmail for email and Google Docs. This makes the transition super easy and ensures you don’t have to waste time explaining to new hires how to utilize company tools; unlike Zoho or Office 365 where there might be more explanation needed. G Suite also has the best compatibility on mobile devices compared to any other email provider. It simply works, everywhere! 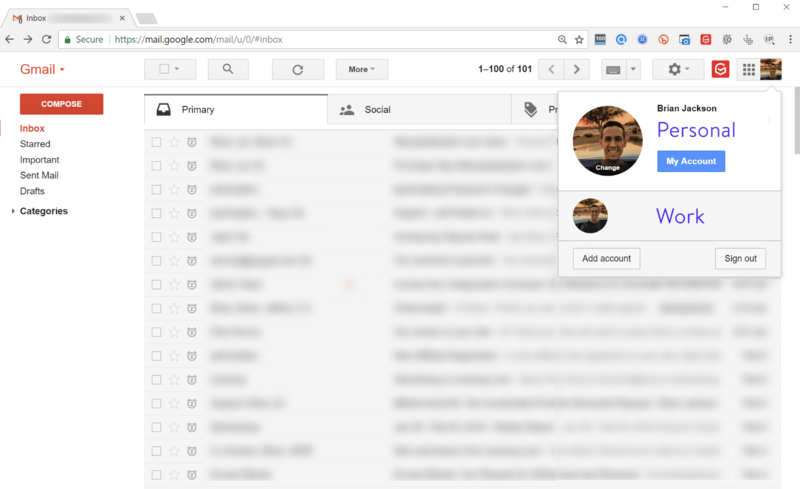 And if you already have a personal Gmail account, Google makes it super easy to one-click switch between accounts (personal Gmails and G Suite accounts). When it comes to uptime, Google is one of the best when it comes to reliability. If you want to dig into the technical details, G Suite offers a 99.9% Service Level Agreement (SLA) for covered services, and in recent years they’ve actually exceeded that. Also due to the fact that email is such an important part of every business, G Suite has no scheduled downtime or maintenance windows. All of their data centers are built with redundant infrastructure. But just like any service, they can never be up 100% of the time. 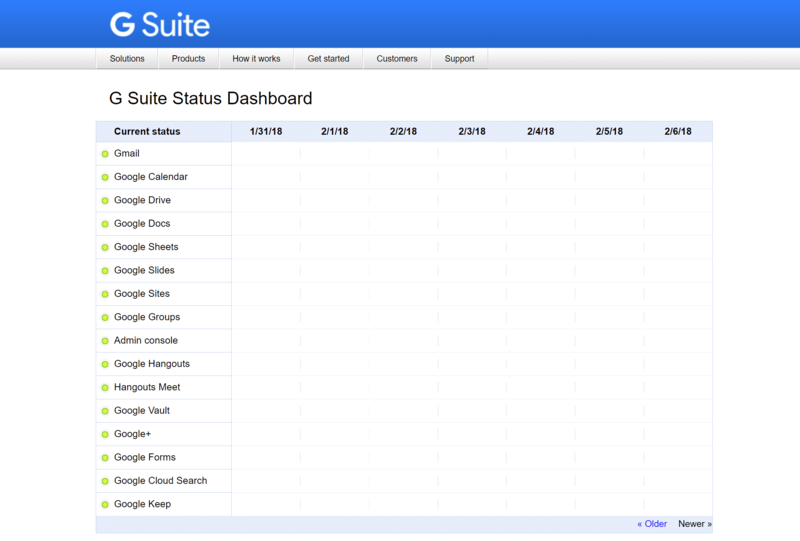 Therefore, you can always bookmark the G Suite status dashboard for updates on all of their products. There are other providers out there that are cheaper, such as Zoho (we’ll dive into a comparison further below). However, just like we always recommend you invest in managed WordPress hosting, your business email is not one of those areas you should try to save a buck. Having an email host that you can rely on can save you money down the road. Here’s a look at G Suite’s pricing and what’s included in each plan. For everything that G Suite includes, that’s a pretty great deal and kind of a no-brainer! You can also opt-in to a discounted rate by switching to an annual subscription. An annual subscription offers savings of up to 20% more than the standard monthly subscription. The great part is you can still be billed monthly on the annual subscription if you prefer. G Suite is built on top of Google Cloud Platform, which offers the highest security on the market. It’s trusted by some of the biggest companies in the world; such as HP, Verizon, Whirlpool, and Salesforce. As Google says, they are leading with a “security-first mindset.” They have industry-leading knowledge and expertise backing each and every one of their products, including G Suite. Encryption (TLS): G Suite provides email encryption in transit. Certs, Audits, and Assessments: G Suite undergoes several independent third-party audits on a regular basis. Data Retention: G Suite offers the ability to retain, archive, search, and export your data. Privacy: Google does not collect, scan, or use your data in G Suite services for advertising purposes. There are also no ads in any of the G Suite products. You own your own data. Transparency: Google continuously provides transparency reports to keep consumers informed. You can check out Google Cloud’s security and compliance whitepaper for more information. There are thousands of email hosts on the market. But when it comes down to serious business email hosting, you can really narrow it down to these three providers: G Suite, Office 365, and Zoho. So below we’ll do a little comparison. For pricing, we are taking the monthly cost from each provider. Some do offer slightly cheaper plans if you commit to their annual plans or purchase licenses in bulk. For example, you can get Office 365 down to $5 /user/month and Zoho down to $2/user/month. Zoho does, in fact, have a free plan for 25 users. However, it is limited to 5GB with single domain hosting. It’s important to note that Office 365 Business Essentials doesn’t include their Office desktop software, only their web-based apps. Below are comparable products across providers. G Suite’s 30GB of storage is counted as combined storage across Google Drive and Gmail. Zoho’s 30GB of storage is counted as combined storage across Zoho Docs and Zoho Mail. If you’re comparing presentation software, Microsoft PowerPoint still probably wins hands down. Gmail also has a lot better integrations with third-party apps than that of its counterpart Outlook. Zoho’s standard (Workplace) plan does include a few additional tools that neither G Suite or Office 365 have, such as Projects, BugTracker, Vault (password manager), ShowTime, Sprints, Wiki. But as you can see, all three of the above providers have very similar offerings when it comes to the tools and services they provide. So a lot of your decision will probably come down to price and ease of use for your employees. G Suite is entirely web-based with no options for software. If you’re used to using Microsoft Office you’ll probably find that Google Docs and Sheets aren’t as powerful. Office 365 is still winning the enterprise market, while G Suite is still playing catch up. Office 365 does offer more storage off the bat. However, G Suite does offer unlimited storage if you upgrade to higher plans. We personally think that G Suite is your best option for email hosting and other tools, and that’s why we recommend it to all of our clients. They also offer a free 14-day trial, so you can even give it a try before committing to anything. Their onboarding process is also incredibly easy. In the Admin console, click “Start Setup” to launch the setup wizard. You’ll give each team member an email address at your domain (like john@yourbusiness.com), so they can start using Gmail, Calendar, Hangouts, and all the other G Suite services. You can also manually add additional users at any time. If you have additional domains, you can also add them or create email aliases. In your Admin console, you’ll then need to follow the steps to verify that you own your domain. You’ll get a verification code to add to your website or your domain settings. G Suite has excellent instructions for literally every DNS registrar and DNS provider on how to verify your domain. If you’re using Kinsta DNS, we also have a tutorial on how to add your Google MX records in our MyKinsta dashboard. Note: If you’re just starting to use email for your business for the first time, you can skip the above migration process. The final step is to then follow G Suite’s quick start guides for setting up the additional apps, such as Google Drive, Google Calendar, Google Contacts, etc. And that’s it! As you can see, G Suite can be a great solution for any business when it comes to email hosting and providing an all-in-one solution for document collaboration and storage. It’s extremely affordable and easy to use. Most of your employees are probably already familiar with Gmail, which helps reduce the time required to learn new tools. If you’re just getting starting with G Suite, we recommend subscribing to their blog to keep up to date with new features and releases. Do you have any questions about G Suite or how it works? We’d love to hear what you prefer when it comes to email hosting. Let us know below in the comments. Great article. I love Google Suites, and for Education had no comparison. Glad to hear it Jorge, we do too! Try Office 365 and you will see the difference! But after moving to G Suite, I can tell you I would never go back. It works great for the team here at Kinsta. Yes, if you’re using flexible billing on G Suite Basic you can upgrade to G Suite Business or Enterprise at any time. I am using ZOHO for free for Personal email. PS.- Just found that Kinsta Blog is not using Local CDN for Gravatars. Some disadvantages would be privacy and security. Google allows access to your personal data to third parties. Many businesses can not use G Suite for this risk. G Suite administrators can easily disallow employees from having the ability to enable “less secure apps” which is really where the problem lies. I have a small online business and my website send 2-5 transaction emails per day. I use Godaddy shared hosting and their email server is not reliable as it doesn’t deliver emails/deliver with delay sometimes. Which is better option to move forward for reliable email delivery: G Suite or SendGrid? G Suite is typically used for email hosting, not transactional emails. 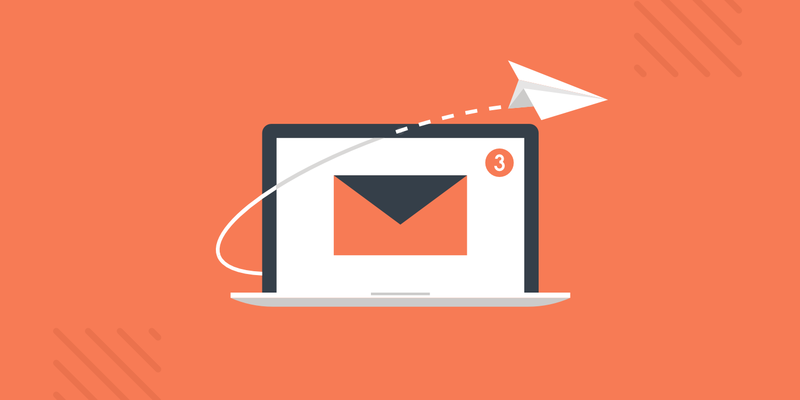 For transactional emails, we recommend checking out solutions like Mailgun or SendGrid.